Zur Anleitung DROPS 149-41 im Original. 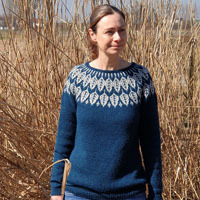 Gestricktes DROPS Stirnband und Schulterwärmer in „Nepal“ mit Blattmuster. DROPS NADEL UND RUNDNADEL (60 cm) NR 5 – oder die benötigte Nadelstärke, um folgende Maschenprobe zu erhalten: 17 M x 22 R glatt re = 10 x 10 cm. DROPS BÜFFELHORNKNOPF, DUNKEL NR 535: 4 Stk. Sie können das für diese Anleitung benötigte Garn ab	15.75€ erhalten. Erfahren Sie mehr. Siehe Diagramm A.1 bis A.3. Das Diagramm zeigt alle R., wie sie auf der Vorderseite erscheinen. Siehe Diagramm A.4 bis A.5. Das Diagramm zeigt alle R., wie sie auf der Vorderseite erscheinen. 4. R: re in der Rück-R .
* 1 R über A.4 stricken, wenden und zurück stricken. 1 R über A.4 + 2 M re + 12 M offene Krausrippen stricken, wenden und zurück stricken. 1 R über A.4 + 2 M re + 12 M offene Krausrippen + 2 M re + A.5 + 2 M re + 6 M offene Krausrippen stricken, wenden und zurück stricken. 1 R über alle M, wenden und zurück stricken *. Von * - * wdh, d.h. es sind 8 R an der breitesten und 2 R an der schmalsten Stelle in einem Rapport. 23 M mit Nadel 5 mit Nepal anschlagen. 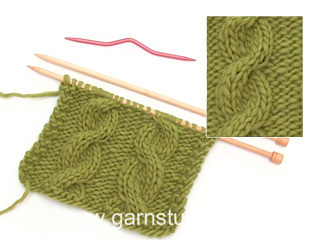 3 cm KRAUS RECHTS stricken - siehe oben. Weiter im Muster A.1 stricken. Nach A.1 weiter im Muster A.2 stricken. Nach ca. 46 cm - achten Sie darauf, dass ein ganzer Rapport von A.2 abgeschlossen ist, strickt man A.3. Nach A.3 werden 3 cm (oder die gewünschte Länge) kraus re gestrickt. Abketten und Anschlags- und Abkettkante sauber aneinandernähen. Die Arbeit wird auf einer Rundnadel in Hin- und Rückreihen gestrickt. 67 M mit Rundnadel 5 mit Nepal anschlagen. 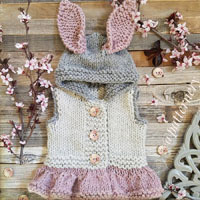 5 Krausrippen stricken – siehe oben. Weiter im Muster wie folgt: A.4, 2 M glatt re, offene Krausrippen über die nächsten 12 M, 2 M glatt re, A.5, 2 M glatt re, 6 M offene Krausrippen, 18 M kraus re. GLEICHZEITIG die VERKÜRZTEN REIHEN stricken– siehe oben. So lange verkürzte R stricken, bis die Arb an der kürzesten Seite 35 cm (oder das gewünschte Maß) misst. Achten Sie darauf, dass ein ganzer Rapport A.4 abgeschlossen ist. 3 Krausrippen stricken. In der nächsten Hin-R wie folgt für die Knopflöcher abk: 16 M stricken, 2 M re zusammen, 1 Umschlag, *13 M stricken, 2 M re zusammen, 1 Umschlag *, von * - * 3 x wdh, schließen mit 4 M re. Weiter mit kraus re bis 5 Krausrippen gestrickt sind. Abketten und die Knöpfe an die linke Blende nähen. Korrektur des 6. symboltextes, der Umschlag wird re verschränkt gestr. When working the short rows, when it says "Work 1row over all stitches" does "all stitches" mean all the stitches worked so far or all the stitches cast on? Dear Sally, when working the short rows, "work 1 row over all stitches" means to work all stitches on left needle = the onen previously worked with the short rows as well as the other ones. Happy knitting! Are the charts to be read from left to right or right to left? Thank you. Hi Deb, The charts are read from bottom right to left on first row. If you are working back and forth the next row is read from left to right, if you are working in the round continue the next row from right to left. Happy knitting! Is this garment knitted from the top down? Dear Mrs Gomes, the cape is worked sideways with short rows. Happy knitting! Hei Torunn. Vendinger er det samme som forkortede pinner: altså på hver pinne fra retten strikker du over fler masker enn forrige pinne. Du skal strikke dette samtidig som du strikker mønster etter diagram - så når det står snu og strikk tilbake følger du anvisningene i diagrammet som vanlig. Altså første gang strikker du en omgang A.4, snur og strikker neste omgang A.4 tilbake. Så snur du arbeidet igjen og strikker neste omgang A.4 og strikker videre 2 masker rett og 12 masker åpne rille. Så snur du og strikker tilbake osv. Dette gjentar du til halsen måler 35 cm i den korteste siden. God fornøyelse. Ang. vendinger. Skal det gjøres etter at hele A4, dvs 20 pinner, er strikket. Eller etter hver pinne av a4? Pourriez vous mettre une vidéo pour le commencement du diagramme A4 svp merci ? Bonjour Patricia, votre demande a été enregistrée, mais en attendant la vidéo, lisez le diagramme en commençant en bas à droite sur l'endroit de droite à gauche et de gauche à droite sur l'envers. Retrouvez sous la légende la signification de chaque symbole. Bon tricot! Thanks for your answer. but i don't understand..i understand how to read the diagram but i don't understand the shoulder piece paragraph. so confused. can you write it step by step. 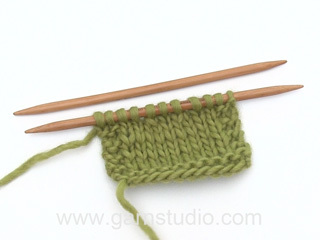 for example, step 1, knit 1 row . step 2, p 1 rows. sorry i am too dumb..
Dear Maple, The Shoulder piece paragraph explains how to work the sts, ie which pattern will be used to work the sts, at the same time work the short rows to get the correct shape. For any further individual assistance, you are welcome to contact the store where you bought your yarn. Happy knitting! 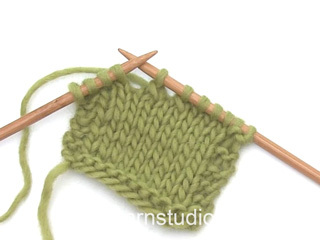 Dear Maple, after the ridges, you work short rows (see "SHORT ROWS" at the beg of the pattern) while working in pattern as follows: *2 rows over A.4. Then 2 rows over A.4 + 2 sts in stocking st + 12 sts in ridge pattern. Then work 2 rows over A.4 + 2 sts K + 12 sts ridge pattern + 2 sts K + A.5 + 2 sts K + 6 sts ridge pattern. Then work 2 rows over all sts (= with diagram, K, ridge pattern ...)*, you have now worked 8 rows over the first sts on the right side (from RS) and only 2 sts on the left side (from RS). Repeat from *-*. Happy knitting! How to star this shoulder piece. the pattern didn't tell ,cast on how many stitches. please help.. Sorry , i find out, the pattern say, cast on 67 sts. 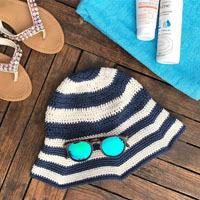 i wish you have video shows us how to knit whole thing. Reading the paper patterns is difficult for new knitters. 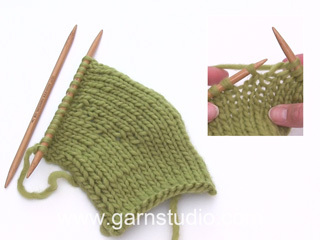 i been learning to knit 2 years already and never success knitting drops design pattern. difficult to follow the pattern. 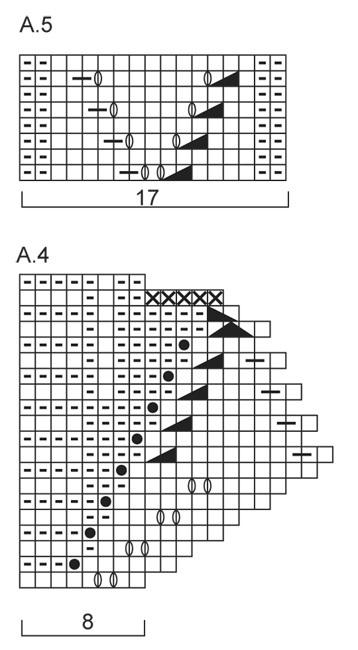 Dear Mrs Richardson, when working short rows follow diagrams at the same time, ie :Work 1 row over A.4 (=1st row in A.4, turn and work back (= 2nd row in A4). 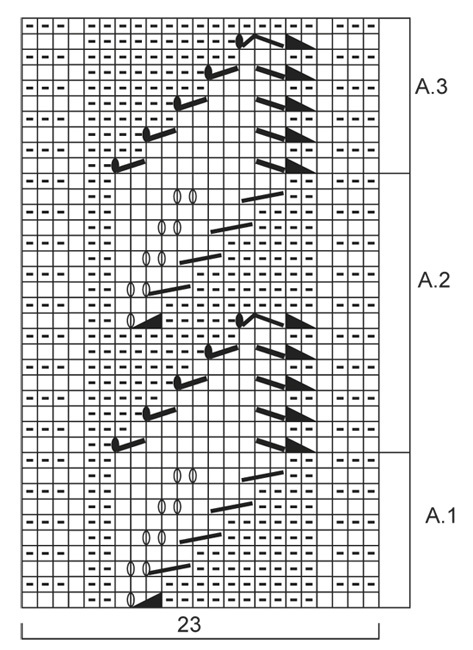 Work 1 row over A.4 (= 3rd row in A.4) + K2 + 12 sts ridge pattern (= row1), turn and work back (= 4th row in A.4 and row 2 ridge pattern), etc. ie work next row from WS as next row in diagram or under ridge pattern, then on next row from RS work next row in diagram/under ridge pattern. Happy knitting!